Our Toyota dealership has recently taken delivery of the new 2016 Toyota Camry in Rochester, NH. Although it is difficult to improve a good thing, Toyota has done just that with this new Camry edition. The 2016 Toyota Camry has received a few new exterior enhancements including a sport mesh front grille, LED headlights, 18-inch alloy wheels and dual chrome tipped exhaust pipes. With a choice of eleven exterior colors and five different trim levels, the new Camry can be customized to suite just about every personality. An updated interior includes new front sports seats that offer better support and comfort, a more spacious interior, available sport leather trimmed seats and red contrast stitching. The new center stack console allows for easy access to an available integrated navigation system, multimedia system, automatic climate control and other convenient features. There are many new technology additions on the new Camry. A helpful trip information screen that displays fuel economy, elapsed time, and cruising range is located front and center of the console. Available, voice activated commands, wireless phone and device charging, Entune Premium Audio and traffic monitoring features are just a few of the modern conveniences the new Camry has to offer. The new Toyota Camry is available with a choice of either gasoline and hybrid engines. For those who enjoy a bit more horsepower, an available 3.5-liter V6 engine is sure to please. 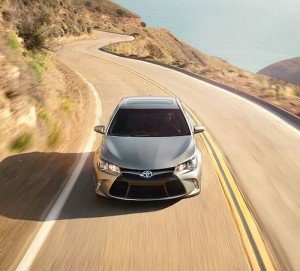 Recalibrated springs, shocks and an electric power steering system make this generation of Camry more nimble and fun to drive than ever before. We invite you to come test drive the new 2016 Toyota Camry in Rochester, New Hampshire. This innovative new Toyota model is offered at a base MSRP around $23,000 and we know it will be one of our most popular new cars.